Located in the Southern Hemisphere, halfway between Hawaii and New Zealand, Samoa is a tropical island nation that isa popular destination for private aviation travelers looking for a relaxing escape. Those looking for a retreat during the summer of the Northern Hemisphere will be pleased to experience Samoan winter from July through September. When working on a private aviation trip to Samoa, you will land at Faleolo International Airport (NSFA), which is located on the island of Upolu, west of the capital city of Apia. For inflight dining options on your departure from Samoa, your needs can be fulfilled through the Air Culinaire Worldwide® Network. As always, it is best to plan your inflight catering needs at least 48 hours ahead for the details of your next leg, especially during peak season. The easiest way to plan and order your in-flight catering is via the ACW Menu app, available for Apple and Android mobile devices. Samoa has many natural sites to visit and enjoy, such as waterfalls, pristine water holes, volcanic lakes, cave pools, blowholes, beaches and lava cliffs. You will have no problems in making the best out of your time on the ground with all of these exciting options. Annual events include Palolo Rise, which occurs for a night in October or November when Samoans harvest “Pacific caviar” from the palalo sea worm; Samoa Independence Day with festivities held on June 1 each year; Teuila Festival, a cultural event held in late August to early September. The Teuila festival features local cuisine, bands, singing, fire knife dancing “ailao afi,” a pageant, tattooing, carving demonstrations and lots of excitement. Main exports from Samoa are food items such as cocoa beans for chocolate; bananas and dried coconut meant called “copra.” Taro used to be Samoa’s biggest export until a fungal blight occurred about 26 years ago. Taro, however, is still a main dietary staple for Samoans, along with breadfruit, bananas, coconut, coconut milk, cream, chicken, pork, fish and shellfish. The traditional Samoan style of cooking is on an “umu,” which is a stone oven that is heated by hot lava rocks. No trip to Samoa is complete without the experience of cooking and eating food on a Sunday or special occasion from an umu. Kava is the traditional Samoan drink and is reserved for special occasions as well. For those who enjoy local brews, Vailima and Taula are brewerys exclusively in Samoa. 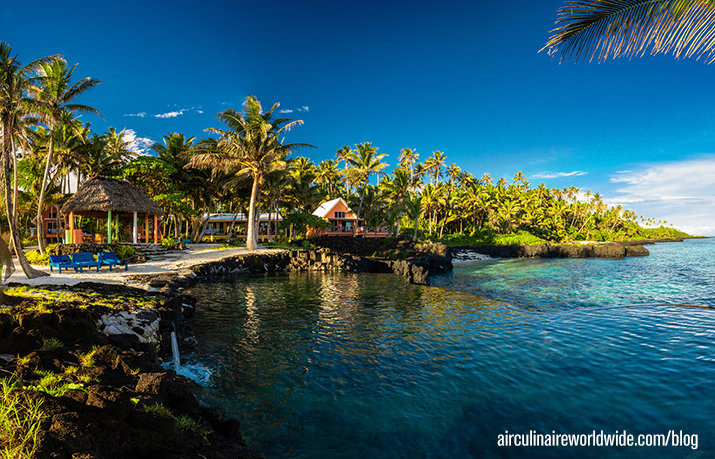 If you have any questions about this article or in-flight catering in Samoa, contact orders@airculinaire.com. For global in-flight dining options, download the ACW Menu app in the App Store or Google Play. Apple®, iPad® and iPhone® are trademarks of Apple Inc., registered in the U.S. and other countries. Air Culinaire Worldwide, LLC is not affiliated in any way with Apple Inc.